If you are running low of internal iPad storage and require a little extra external iPad storage to keep your movies and media stored on. You might be pleased to know that Seagate have today announced a new external storage drive added to their range that will allow you to stream movies and media directly to your iPad and Android tablets. The Seagate 500GB GoFlex Satellite is the first battery-powered external hard drive to wirelessly extend the storage capacity of any Wi-Fi enabled mobile device. Its fitted with a rechargeable battery and is able to connect to your iPad or Android devices using Wi-Fi over 802.11 b/g/n, and its also fitted with USB 3.0 connectivity to enable fast transfer of media to and from the storage device via a computer system. 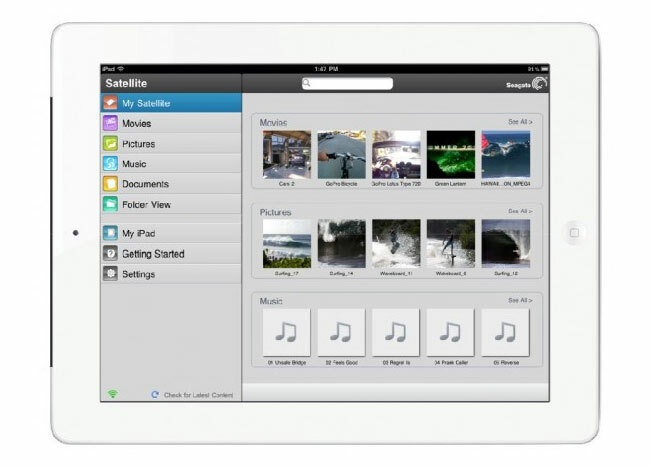 Devices are wirelessly connected to the GoFlex Satellite drive by use of the free GoFlex Media app available now on iTunes and the Apple App Store or a web browser. Seagate is currently developing an Android app which is expected to arrive this summer. But Android users can still access content on the external GoFlex Satellite storage device by using their browsers for the time being. On a full charge the internal battery is capable of providing 25 hours of standby, or up to 5 hours of continuously media streaming. GoFlex Satellite is available immediately for pre-order for $199.99, and is expected to arrive in stores during July 2011.